With the fifth overall pick of the 2009 draft the New York Jets chose the 6’2”, 227 lbs. quarterback out of the University of Southern California. Sanchez is a possibly risky pick for the Jets who need desperate help at the quarterback position. Sanchez is risky, not because of his skill, but because of his limited experience as a college starter. Sanchez will most likely get tested right away as the Jets starter. 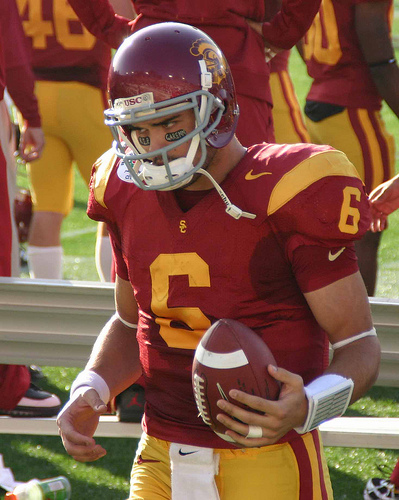 Although Mark Sanchez started for only one year at USC, he made the most of it. USC is “Quarterback University” under coach Pete Carroll and Sanchez was no exception. Sanchez threw 41 touchdowns in 27 games. He led a vaunted USC Trojan team to a Rose Bowl bludgeoning of Penn State, winning the MVP award in the process. The Trojans ended the season with one loss. Sanchez is a mature QB despite his inexperience at the college level. He sees the game unfold before him and makes few mental errors. Sanchez is able to make any NFL pass and makes it tough on the defensive backs with is quick delivery. He trusts his receivers to run the route. He also uses all of his weapons by spreading the ball around the field. It’s tough for the defense to key on any one offensive weapon. The downside to Mark Sanchez is obvious: experience. With the Jets it is not likely that he will get a learning curve as an NFL quarterback. The schedule does not start out easy either with games against the Patriots and Tennessee in the first 3 weeks. The Jets chose Sanchez for his tremendous potential. We’ll have to wait to see if it pays off.